Volkswagen is known for the classic cars. One of the most iconic Volkswagen models is the Volkswagen Golf. The classic hatchback design has become a staple in the automotive industry. The 2018 model follows years of tradition and features a sleek and sporty hatchback design. The 2018 Volkswagen Golf is as fun to drive as it looks! Here at Ontario Volkswagen, we have a great selection of 2018 Volkswagen Golf models that you will love! Our number one priority is having you leave in our lot in a Volkswagen you will love to drive for years to come. Read more below about the 2018 Volkswagen Golf! The 2018 Volkswagen Golf was designed to pay homage to its roots but is also modern thanks to all the great technology. Driving the 2018 Volkswagen Golf will turn driving from a chore to an experience. If you have any questions regarding the 2018 Volkswagen Golf, feel free to contact our sales team here at Ontario Volkswagen, in Ontario California! 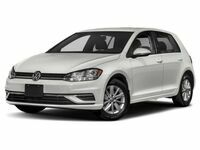 You can view our inventory online, and if you are ready to get behind the wheel of a Golf, you can schedule a test drive online today!